Dr. Christman and his wife, Kristi, owners of Silver City Chiropractic, P.S., vow to serve the individual health care needs of each patient with extraordinary effort and care. We are passionate about improving the quality of life for each person we meet and their families by providing the best health care available, in the most sincere and professional environment. We believe our bodies are created with an inborn ability for health that can be fully expressed through chiropractic. Our dedication to people and health is constantly growing as we continue to learn new information and ways to serve you! We value your trust and consider it a privilege to serve you! We work hard to maintain the confidence you have placed in us, and thank you for your help in educating and referring others to chiropractic care. "Dedicated to Making Your Life Better!" Dr. Joe and family celebrating Vaughn's piano recital December 2015! A 1998 Graduate of Life Chiropractic College West in San Leandro, CA, Dr. Joseph Christman and his wife immediately formed Silver City Chiropractic, P.S. in Silverdale. They wanted to plant their roots and raise their family in Kitsap County where Dr. Joe was born and raised. Dr. Christman's passion for Chiropractic and sincere care for his patients is evident immediately upon meeting him. His specialties include extremities, and difficult spinal cases with an emphasis on organic chiropractic. Dr. Christman is highly knowledgeable in nutrition and various exercise activities, and has been an athlete all his life. 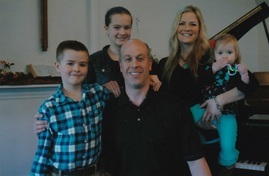 He assisted in the home births of all three of their children, where Kristi now has the blessing of nurturing and Home Schooling Olivia 15, Vaughn 13, and Evangeline 4.